So I enjoyed yesterday’s Smokey Salad so much that I decided to put together another variation of that today for my lunch. I used the same basic idea, but worked with some slightly different ingredients, looking for a similar effect, but with a very different combination of flavors. I started with the spring salad mix, the same as yesterday, I was looking for the added color that the red lettuce brings to the dish. Then I added the crimini mushrooms. Crimini mushrooms are such a versatile, and flavorful food, I just love finding ways to use them. Also, like yesterday, I used mint and green onions. Here’s where things start changing a bit though: instead of smoked turkey, I chose smoked ham. And to support the flavor of the smoked ham, I made a few other substitutions as well. I eschewed the avocado in favor of cucumber. It’s not an intuitive choice, I know, but here’s why I did it: most varieties of smoked ham I have sampled take the smokey flavor more slowly than turkey. I’m not sure why that is, but what it means is that the flavor will be more subtle, which means I need to make certain that the other flavors don’t overpower it. Ham has it’s own unique flavor, and it is quite delicious, when used properly. Also, to bolster the flavor of the dish without adding further power, I added apples. Again, I used the toasted sesame oil, looking for the smokey flavor it brings to the dish. 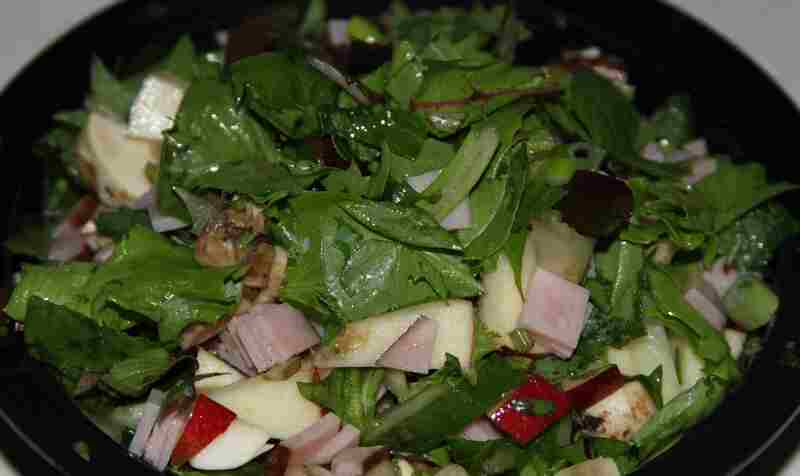 Mixed together, the flavors of the apple, the smoked ham, and the toasted sesame oil all come out with gusto, and it’s excellent! I hope you try it, and other urbanpaleochef favorites! I’m a big fan of the Smokey Salad. Yummy and so healthy! Slam dunk on this one Chef! Thanks! Yeah, this one came out really well. The apple really enhanced the smokey flavor, without stealing the show.